James O. Causey got his start in the 1940s writing short stories for “Weird Tales” and “Detective Story Magazine.” As the pulps died off, he became a highly-regarded, if not well-known, author of short, hardboiled crime novels. Stark House has compiled three of Causey’s classics into one volume for 21st Century audiences. The new trade paperback includes “The Baby Doll Murderers,” “Killer Take All,” and “Frenzy” as well as an introduction by Nicholas Litchfield. 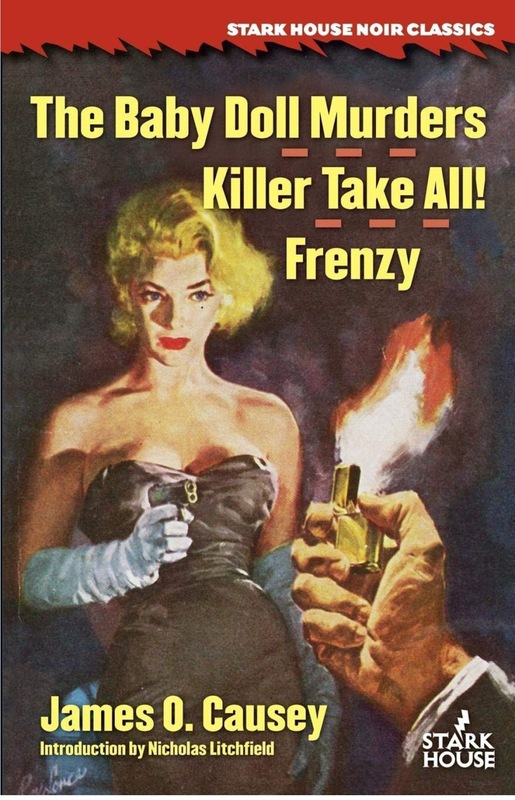 Because I love a good con-man story, I pounced on “Frenzy” to read and review here. 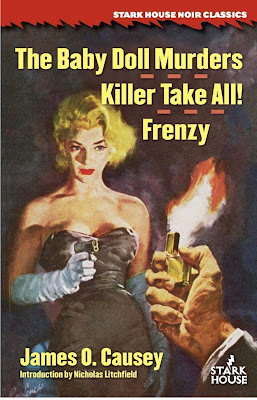 It’s important to note that Causey’s 1960 paperback “Frenzy” was not the basis of the 1972 Alfred Hitchcock movie of the same name. Hitchcock adapted the unrelated 1966 book “Frenzy” by Arthur La Bern for his film. Our narrator is Norman Sands, a two-bit con-artist and card cheat, who finds himself in hot water after a plan to steal a Casino boss’ girl and money fails spectacularly. Needing to lay low, Norman winds up in his childhood hometown where he becomes reacquainted with his struggling brother, Matt, who is convinced their crappy hometown is about to become an oil-rich boomtown. For his part, Matt is excited to have Norman back to be his business partner in a dicey real estate and oil drilling venture, and Norman quickly converts Matt’s plan into a series of profitable bunco schemes. Growing up, Matt was always the “good son” who was shooting for honor roll while Norman was shooting pool. Early in the novel Norman tells us his teenage origin story, and it’s a doozy, rivaling the youthful flashback from Dan Marlowe’s “The Name of the Game is Death.” The first few chapters of “Frenzy” were very promising, but then things fizzled out quite a bit. Once Norman makes it home, the scams depicted in “Frenzy” - and there are many - mostly involve oil drilling rights, land speculation, and municipal contact fraud. The schemes get a little complex and hard to follow, and the morass of local political corruption that sweeps up the brothers wasn’t always an exciting read. Moreover, the plot was all over the place - the ups and downs and scams and schemes made for an exhausting and meandering read. Despite problems of plot and pacing, Causey’s hardboiled, first-person prose is among the best. For example, His descriptions of acts of violence are vivid while also being matter-of-fact. Taking a professional beating in the groin, ribs, and kidneys is just an occupational hazard in this world, and those scenes were vivid as hell. Despite some great writing and a smattering of amazing scenes, it’s hard to give “Frenzy” a full-throated recommendation. The plot was just too messy to gel into a coherent storyline. However, I’m not giving up on this author. I read enough great stuff to see that he was a unique noir talent. This one just wasn’t his masterpiece.